Sports. Now you can even save music information with the newest feature. Dates are saved as scrap feature. YouTube Search Feature : You can even search YouTube video with scrapped music info. SNS Feature : If you want to share the music that you are listening to, use the SNS feature to share it on Facebook, Twitter and Weibo. Purchase Feature : Now you can buy the Amazon music at RadiON with scrapped music info. * Real-time Channel Information : You can see which song is playing on certain channel. * No more boring default-alarm sound! 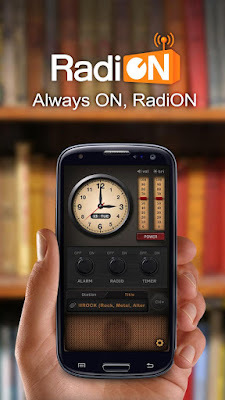 * Start your day with your favorite MP3 music or Radio station by RadiON..
* Alarm sound is not enough! Then shake your phone to wake up! *Use RadiON's 'Shake' feature to turn off the alarm. You won't be sleepy anymore! * Enjoy Worldwide Radio channels with RadiON! * Want a good night sleep? Sleep with RadiON! * Try RadiON's Timer feature. Have a good night sleep with your favorite radio station.